Exterior view, Eastern Female High School. Photograph by Johns Hopkins, 2015 July 11. Eastern Female High School at 249 Aisquith Street has been a Baltimore City Landmark since 1976 and a 2002 Baltimore Sun editorial called the building one of Baltimore’s “architectural gems”. The school is listed on the National Register of Historic Places and has appeared on the Register’s travel itinerary of historic sites in Baltimore. The building was renovated and converted into apartments in the 1970s. Baltimore City transferred the building to Sojourner-Douglass College in 2004. It continues to stand boarded up and vacant. 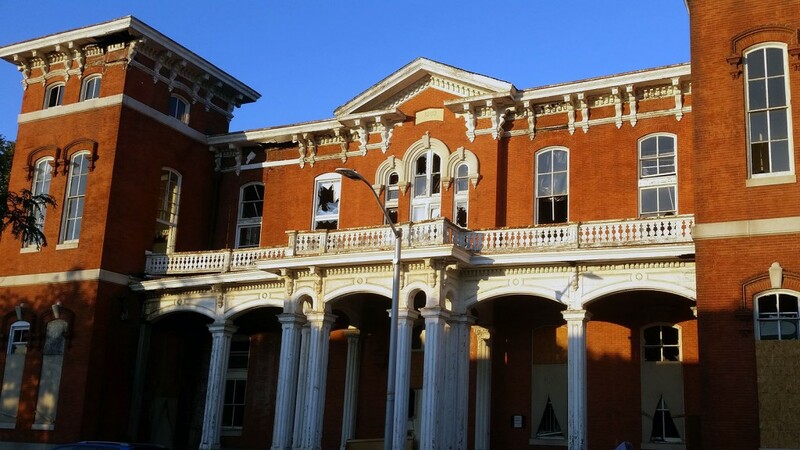 The building suffered a major fire in 2015 but Baltimore City is continuing to seek a developer with an interest in reusing the building. This 1869-1870 Italianate-style, red-brick and white-trim structure is the city’s oldest surviving purpose-built public school building. It is also a memorial to the post-Civil War expansion of secondary education opportunities in Baltimore.